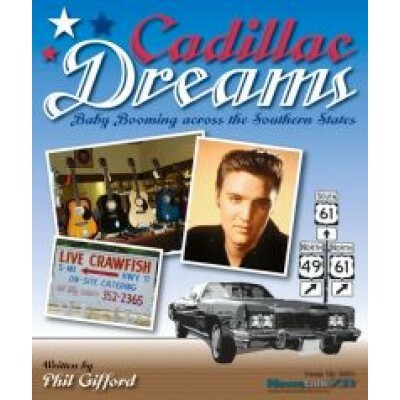 "Cadillac Dreams: Baby Booming across the Southern States" is the story of four kiwis living the dream of a lifetime, a musical journey across the southern states of America. Written by Phil Gifford, a multi-award winning journalist and radio host, the four revel in live music at a juke joint in Clarksdale Mississippi, a crawfish festival in Breaux Bridge Louisiana, the Grand Ole Opry in Nashville, the Continental Club in Austin Texas, the National Blues Awards, and rock and roll's legendary Ponderosa Stomp in Memphis. They visit Graceland, Jerry Lee Lewis' family home in Ferriday Louisiana, Elvis' birthplace in Tupelo Mississippi, and have close encounters with alligators in the Louisiana bayou. They stay at Heartbreak Hotel in Memphis, and a former sharecropper's shack in Mississippi. They eat ribs in Memphis, frijoles in Texas, hushpuppies and catfish in Mississippi, and onion-mums in Louisiana. If you've ever dreamed of visiting the land that brought the world the blues, country and rock and roll music "Cadillac Dreams" is a must read.